While issue #2 felt like a detour from an otherwise superbly presented mini, Schism #3 gets us back to the tight storytelling and well-placed humor Aaron delivered in the first issue. The bulk of the issue takes the X-Men off of Utopia (wow, just typed that out as "Genosha"; no wonder Utopia feels dull and overly familiar) to the opening of the Mutant History Museum in San Francisco. It's interesting to see well known and new characters alike reflect on their shared heritage, and it also reveals how Aaron is constructing this story to define a new chapter in that short history. Once all hell breaks loose (courtesy of the new Hellfire Club), the X-Men find themselves face to face with a young enemy they will surely underestimate. Often fight scenes in event titles play out like a round of Street Fighter; each issue has plenty of brawling, with it all coming down to two fighters with an inevitable K.O. Both Jason Aaron and Daniel Acuna prove the exception by presenting clever challenges unique to the characters. Comedic moments are not in short order either, as the kids of the Hellfire Club make as many wisecracks as you'd expect from 12-year-old villains. I don't think one boring old punch is thrown in this book. Then again, Acuna has some experience in portraying memorable fight scenes (see Black Widow with Marjorie Liu). I look forward to seeing what will happen when Aaron actually brings the big guns and pits Logan and Scott against one another. 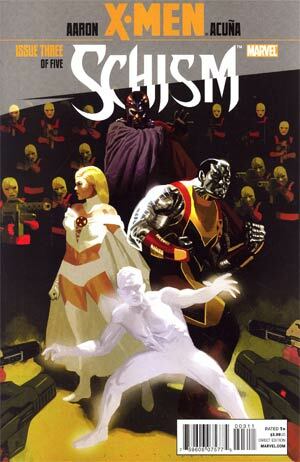 Perhaps Schism's greatest weakness is that the audiences know what will be the climax and end result. Verdict: It'll be tough for the next two issues to be as good as this one, but I'm willing to buy them and find out! X-Factor is a book that I always count on to deliver the goods, and this issue did not live up to its predecessors. For starters, events transpire between #223 and #224 that make it necessary for even a longtime fan to read the prologue. It felt like Peter David didn't know how to get around a plot hole, so he had certain events happen off panel. Specifically, Rahne is left at the end of the last issue being helped into a cabin by a stranger so she can give birth to her unborn cub; now we find her prisoner of said stranger. Of course, she is never in any real danger as the (very gruesome) birth of her cub results in the would-be baby snatcher getting his comeuppance. Rahne's immediate abandonment of her child also seems poorly justified. Sure, the wolf murders the first person it sees, but fighting a primal urge to kill is nothing Rahne isn't familiar with. David also ignores very recent events by presenting Hela in her original form despite having her character defeated / combined with X-Factor's own Darwin just last story arc. Am I being nit-picky? Am I that crazy fan that thinks the writer is ignorant of their own work? I may be straying into whiny fangirl territory, but I have high expectations for this title and this arc did not meet my standards. Verdict: Not the finest moment in this series, but I'll still be coming back for more. Here's hoping I'm not disappointed. Despite having a repetitive concept (we get to see the same events of Schism #3 but from Idie's viewpoint), this issue was an insightful read for fans of X-Men: Schism and Generation Hope alike. 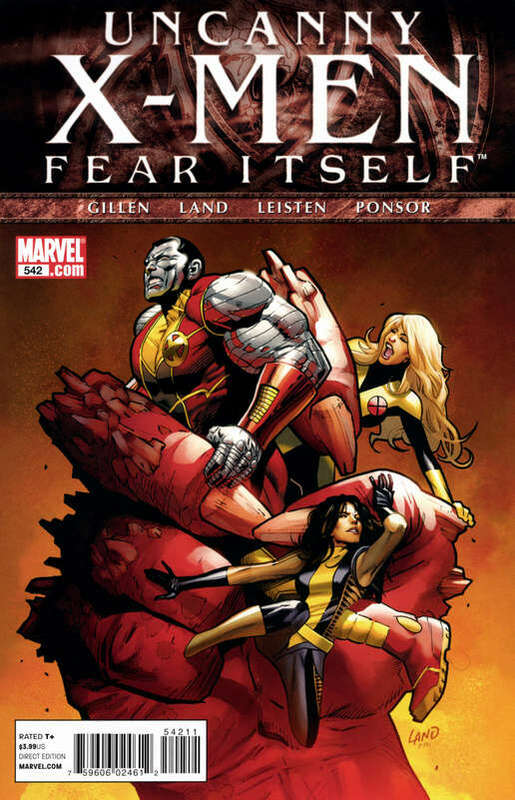 Idie, a young new mutant on Hope's team, finds that she has become the last line of defense between the Hellfire Club and the incapacitated X-Men, as well as a vulnerable group of human bystanders. 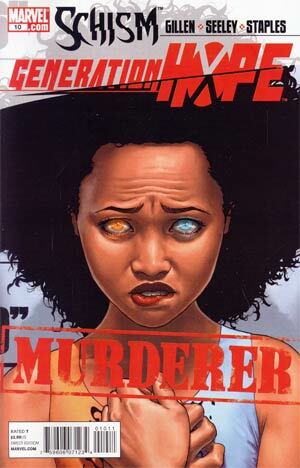 Despite objections from an absent Wolverine, Scott tells Idie to do what she feel she has to. We know from the beginning of the issue what that will end up being. The events that lead up to this final harrowing moment show us just how different the younger generation of mutants are from their mentors. While the older ranks experienced far more personal tragedies, partly because they did not know what they were, the newest generation weren't just gifted anomalies. They were born into a hatred that went beyond a fear of the unknown. Their loved ones knew what they were, and Xavier's school was never a well hidden sanctuary for these children. They grew up with the X-Men. 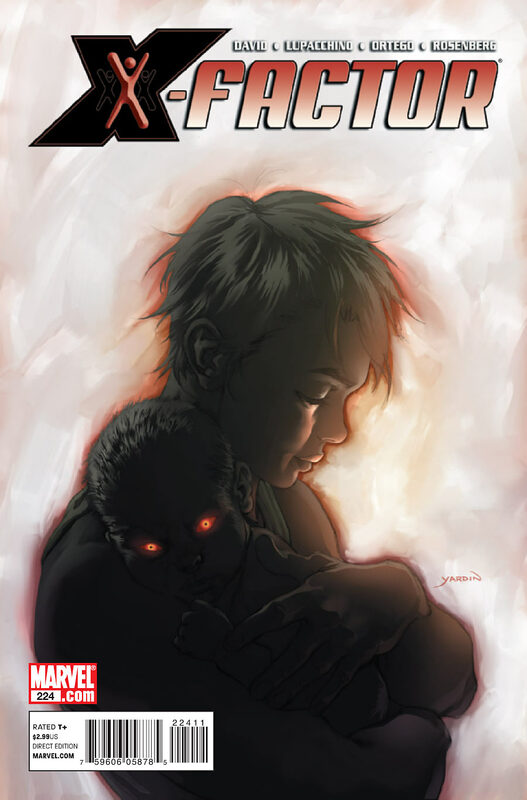 Sadly, this issue does not reveal anything about Idie's past, and as a new reader I don't know if it has yet to be revealed or just hasn't been discussed since I began reading. Either way, the next issue (another Schism tie-in) would be a perfect opportunity to show readers why this character considered herself a monster long before she got blood on her hands. Tim Seeley takes over the art for this issue, and though he is very capable, it is difficult to cultivate regular readers with such frequent artist changes. Verdict: An improvement over the last issue, but these young mutants still struggle to find their own place in the line of x-books. Another surprising issue this week, Uncanny X-Men #542 was an engaging read with an ending that makes this event tie-in relevant to the X-Men. Rather than the comical introduction seen in issue #541, here we see exactly how unstoppable this supernaturally enhanced villain can be. In an effort to stop Juggernaut from attacking San Francisco, Cyclops sends in mutant after mutant, resulting in failure each and every time. A solution is sought through Magik, a team member that has recently been deemed untrustworthy due to her attraction to the dark arts (and we quickly see why). I think this story functions well on two levels; one, it presented the Fear Itself villain as an enemy with a lasting impact rather than a distraction to be dealt with in three issues, which is the m.o. for most event tie in issues. Secondly, the tie in does not overshadow the regular narrative of the book. We still get to see some of the internal conflict the X-Men books are famous for as Emma Frost fights a murderous desire for one of her teammates. Though I'm still not keen on Greg Land's artwork, he does well with the action sequences and creates easy to follow imagery in some challenging settings like the Crimson Cosmos. His work here only really distracts from the story whenever female characters are presented (they all. look. the same). Clearly the males get different photo references, so why not the ladies? Verdict: A decent tie in that doesn't feel like a detour from your normal Uncanny X-Men story. Most weeks during Odyssey X where I've had this many books to read, it has not been a task worth looking forward, but I was pleasantly surprised by the reading this week. Not one title felt like a waste, and that's even with two books that dealt with the same event (Schism). But even a good read can be unwanted when it is too frequent, and thus too costly. Three out of four of this weeks titles have seen their last issue less than three weeks ago. Another way to see it, half of these issues have been bi-weekly this month. Quality and interest are mighty hard to maintain on that kind of schedule, and I hope that a "less is more" mentality will be adopted for the x-books post-Schism. I'm not holding my breathe though.